ALL FOR ONE AND ONE FOR ALL! 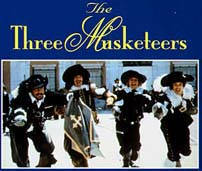 The Musketeers face adventure and challenges as they protect the Queen's honor and reputation. The cast includes: Richard Chamberlain, Raquel Welch, Michael York, Faye Dunaway, Oliver Reed, Christopher Lee, Charlton Heston, Jean -Pierre Cassel, Geraldine Chaplin, and Frank Filnay.